Rarely does an anglophone spend more than a few days in Paris without venturing over to its most famous expat bookshop, and perhaps the most famous expat shop in the world, Shakespeare & Co.
Jeffrey Mercer wandered over to Shakespeare & Co. in the early days of his Paris sojourn and pretty much never left. 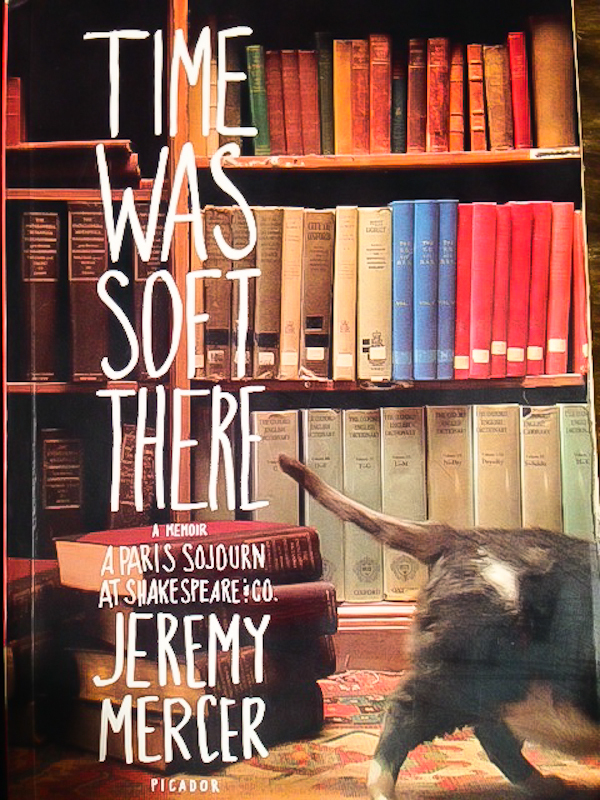 Time Was Soft There is Jeremy’s tale of adventure, misfortunate, fortune and love while staying and working at George Whitman’s Shakespeare & Co. in 1999, towards the later years of Whitman’s life. Through his personal narrative, Mercer tells the story of the bookshop (or at least it’s reincarnation dating from the 1950s) and of George Whitman himself. The first iteration of Shakespeare & Co. was of course founded and operated by Sylvia Beach before World War II. Mercer skillfully captures the spirit of the shop, seeped in the legacies of so many literary greats who found refuge there (literally and figuratively), and adds a sheath of humor along the way. He documents a good part of the history of the shop, shows Whitman’s idiosyncrasies and tells of his own odd journey that brought him to this place of soul-searching and of exchange with other literary wanna-be’s if not at that time literary greats. I found the stories a bit repetitive towards the end; the final chapters dragged a bit. Nonetheless, I enjoyed the multi-layered account and highly recommend the tale of this legendary shop and its owner to anyone living in or traveling to Paris. Have you read Time Was Soft There? What did you think?